Comparing longevity annuity rates or QLAC income rates should be an easy task to complete. Following the tips in this article to navigate you thru the QLAC process with maximize your purchasing power. Call your financial advisor and tell her to get you the top three companies paying the highest income amount given your initial deposit amount. Problem is does your financial advisor want to transfer your manageable billable assets out to another company even If it is in your best interest? Second the commission is very low and usually one time. This is a loss for your financial advisor at your increased retirement income gain from the purchase of a QLAC. These factors are a common behind the scenes issue that your advisor might have. There are less than 10 longevity annuity or QLAC companies offering consumer annuities. It should be easy to get access to longevity annuity consumer brochures and information for each company. Investment minimums are as low as $5,000 and not the stated $25,000 initial investment usually told to you by financial advisors. This difference in minimums is “justification” from the low commission and sometimes heavy paperwork an advisor must complete in order to establish a QLAC or longevity annuity. Remember $125,000 is the maximum the Treasury Department will allow into a QLAC or Qualifying Longevity Annuity Contract from their summer 2014 rule. Tip # 4 Flexible deposits or stacking is available. Once your initial deposit is made most longevity annuities allow for monthly deposits as low a $100 per month. Each additional deposit “stacks” income on top of your initial quoted monthly income rate. 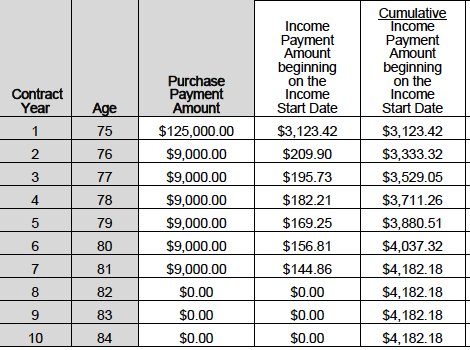 As the example below shows an initial deposit of $125,000 at age 75 with annual deposit of $9,000 per year until year 7 gives him a total income of $4,182.18 per month. Look closely in the second year he deposited $9,000 which gave him an additional $209.90 in monthly income at age 85, which was his initial income start date chosen at application. Each year his deposits stack on each other to give him a higher income amount. Did you notice that each year he makes the same deposit amount, $9,000 in this example, but his monthly income each year is lower. This is because his deferral period is lower each year and his longevity credits are smaller each year for a lower income “stack” each year.QLAC is a longevity annuity also know as a Qualifying Longevity Annuity Contract. Usually a one time deposit for a guarantee lifetime income at a future date chosen by the applicant. Options include inflation income adjustments, death benefits of deposit and joint annuitant for income.